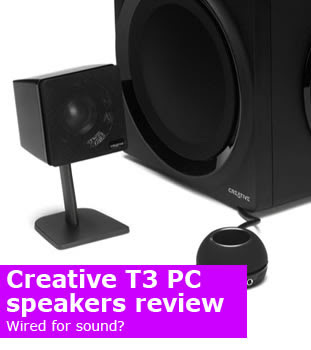 "... the Creative GigaWork T3 speakers will blow you away - literally. The sound is, for want of a better word, amazing." why don't you set up a pro-Creative fansite? do it good and fast and you can replace epizenter and at a time when Sim reinvents Creative. the site is not really pro-Creative and even the moderators aren't really. Kingone, any idea what's the difference between the new gigaworks series 2 and their predecessor? Karil: New packaging. They look a little different as they are rounder at the bottom and the blue light is no longer as glaring as it is. The knobs to control the volume has also been changed. The T40 Series 2 is also more powerful now at 16 watts instead of the previous 14 watts.